Lemax Mrs Claus Kitchen sights & sounds table piece depicts the delightful north pole bakery at Christmas time feeding Santa and all his helpers. Mrs Claus oversees the sizeable task of baking Christmas cookies, cakes, bread and pies for all, in this wonderful seasonal bakery. Lemax Miniature table piece, with authentic vocal & musical soundtrack with animation and LED lit internal window scenes. Elves move in and out of the bakery whilst the Gingerbread man swings side to side to the soundtrack. Mrs Claus helpers move in and out of the oven, and the cakes and cookies can be seen moving in the window scene, making this a wonderful cheerful Lemax building. A mains powered illuminated and musical building suitable for placement in and amongst a seasonal Lemax village Christmas scene. A unique Lemax Santa's Wonderland collectable table piece which joined the Lemax collection in 2018. 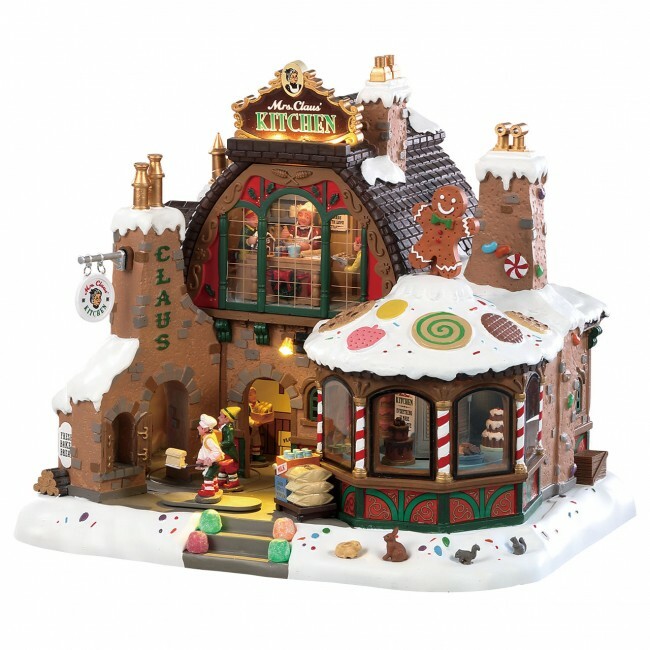 Mrs Claus Kitchen offers a delightful self standing polyresin (& plastic) building on an individual base to compliment your seasonal Lemax Christmas Village.